Medical imaging is an important and growing field of research in the healthcare domain. The advancements of technology in medical imaging are a step towards effective healthcare and patient friendly gadgets. With the advancement in technologies, the possibilities of early detection of diseases and its precision levels are increasing which provides more time to patients as well as medical practitioners so that better treatment can be availed at an early stage. The pre-diagnostics analytical support of any disease provides the medical practitioners a broader scope to treat patients in a more precise direction. Digital radiography has been available in dentistry for more than 25 years, and its use by dental practitioners is steadily increasing. In dental practices, postprocessed images of digital dental radiographs are most commonly used. To enhance image quality and increase the accuracy of interpretation, digital acquisition of radiographs followed by their computational processing is performed. 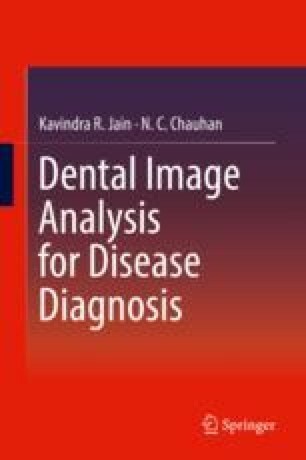 Using techniques of image processing, dental radiographic images can be easily processed in a desired way, thus helping practitioners in their further diagnosis.